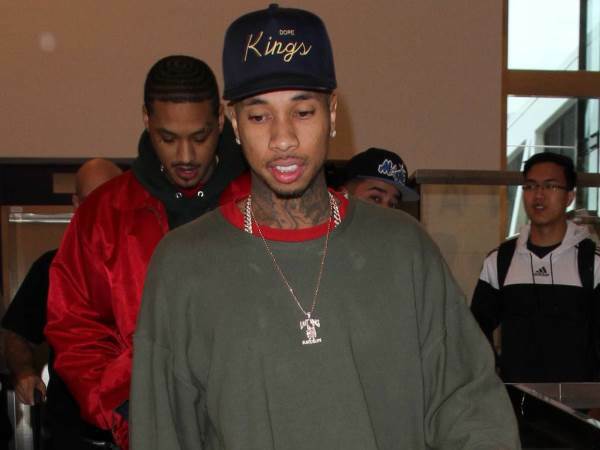 Rapper Tyga reportedly began feeling "extremely ill" when he was questioned about the expensive gifts he buys for girlfriend Kylie Jenner during a hearing on Tuesday. Staff at the Jason of Beverly Hills jewellery store hired lawyers earlier this year in a bid to compel the 26-year-old to pay the $208,330 (about R289 7286) they claim he still owes them. The first hearing was held on Tuesday in Los Angeles, with the store's lawyer Boris Treyzon questioning Tyga about his lifestyle, how much he earns and what he owns. While Tyga was initially happy to answer Treyzon's queries, when the questioning turned to Kylie and the extravagant gifts he appears to have purchased for her over the past few months - including a $189,000 (about R262 8460) Mercedes-Benz Maybach car - the rapper started to feel unwell, TMZ.com reports. A source told the outlet that Tyga, real name Micheal Ray Stevenson, "started feeling extremely ill, lost memory and became confused, telling the lawyer he just couldn't go on." TMZ also report that Tyga would be unable to deny the expensive gifts he gave Kylie because she has frequently gushed about the presents on her social media pages. The hearing has now been rescheduled for 1 November, 2016 when Kylie is also set to come in for a separate interview about the gifts she has received from Tyga during their on-off relationship. Treyzon and co-attorney Danny Abir are the same legal team who successfully pursued a similar strategy in getting Tyga to settle a dispute over $480,000 (about R667 5456) in unpaid rent, damages, compensation for alleged vandalism, and legal fees with a former landlord in August, 2016. Tyga's jewellery debt dates back to January 2014, when a judge ordered him to pay up for not returning a diamond Cuban link chain he borrowed in 2012, and for failing to pay for a diamond pantheon watch.